It’s not the way I wanted my obituary to read. I stepped out of Amsterdam’s Centraal Station onto a cloverleaf of tracks, heading for the #5 tram across the yard. What I didn’t notice was the #12 aiming for me. “Drop the suitcase!” my husband and friends hollered. I blinked, stared and froze like a piece of bad, government-commissioned public art. Then the adrenaline kicked in and I darted back to the curb. I got a lot faster over the next few days out of necessity. Surviving your stay in the Venice of the North requires constant attention to the city’s synchronized chaos. Designed in a demilune following 3 major canals, the streets are a constant blur of motion with pedestrians, cyclists, cars, scooters and trams sharing equal rights. And there are no guard rails at the edge of the water. If you’re like me and sashay instead of stride, you must remain alert at all times. Once I relearned walking, I was good to go. What I never learned was how to cram more hours in the day so I could stuff more food in my piehole. Amsterdam’s a glutton’s delight, offering a wide range of tastes in a variety of venues. So many pancakes. And beer. I needed serious help. I sought assistance from Eating Amsterdam, a new tour operation that seeks to introduce visitors to local neighborhoods via their stomachs. Our guide was Annamaria, who is Hungarian/Romanian by birth, but Dutch by choice, having lived for 9 years in Amsterdam. We started the day in Café Papeneiland, one of the oldest brown cafés in the city; the name is derived from the warm, dark, tobacco-stained interiors. 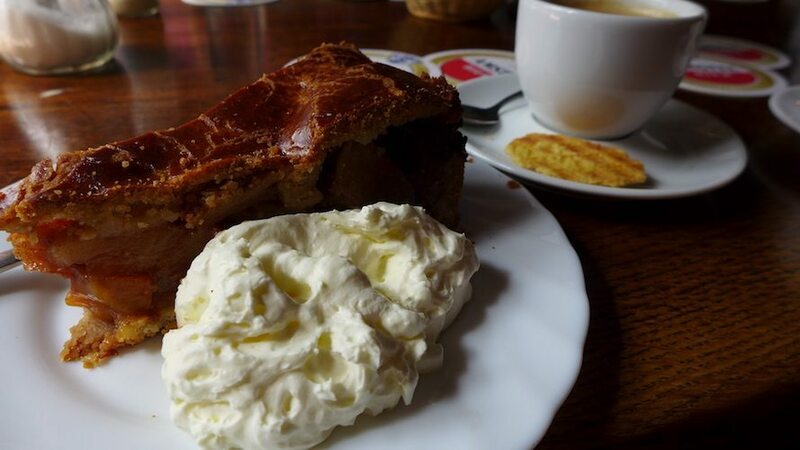 Our first bite was one of the day’s best – a slice of traditional Dutch apple pie. It’s higher and lighter than our US version with raisins providing added chew. President Clinton loved it so much he took a whole pie back to his hotel room. Cue the rimshot and fill in your own joke. At our next stop, Swieti Sranang, we met Hank the owner and got up close and personal with Surinamese lunch grub. Broodje is the Dutch word for sandwich and Hank serves up a variety of spiced meats on bread. We also tasted a fried plantain with a yummy peanut sauce. Our tour group was beginning to wonder how we were going to haul our already heavy stomachs around for the next few hours. Luckily, we were in the hands of a professional. Annamaria kept up a brisk walking pace as we visited the tour spots, located in the gentrified Jordaan, a former working class district. The Jordaanese have their own music and customs and, according to Annamaria, are known for their sarcastic, dirty humor. To a bunch of New Yorkers, it felt like home. 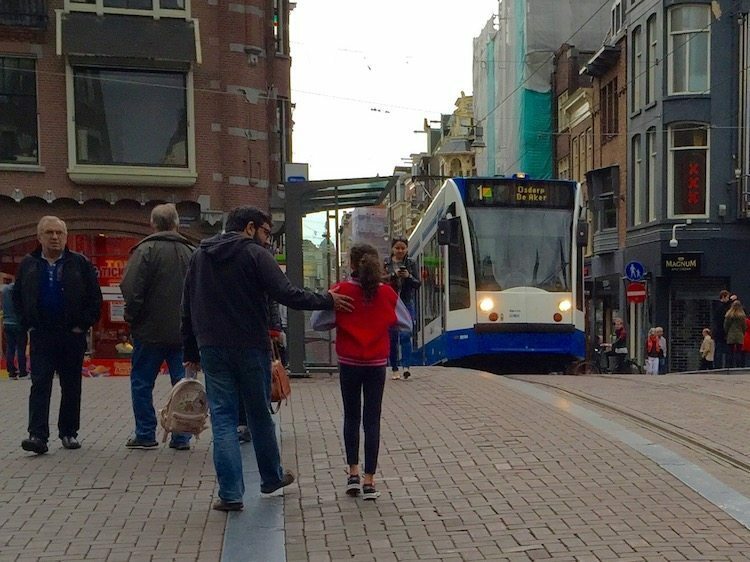 Throughout our trip, we found the Dutch to be warm, welcoming and extraordinarily friendly. And tall. So very tall. It’s like they grew to complement the long, lean façades of the canal houses. Next, we visited the best butcher in the world for some incredibly tasty sausage. Standing outside Louman’s, I was cornered by a local who couldn’t stop gushing about the meats. He confessed to indulging a daily habit. It’s bad for his cholesterol but I felt worse for his poor dog who kept running into the store, straining at his leash and drooling for the contents of the refrigerated case. Cruel and unusual punishment indeed. And then we got lucky. Incredibly lucky, according to Annamaria. 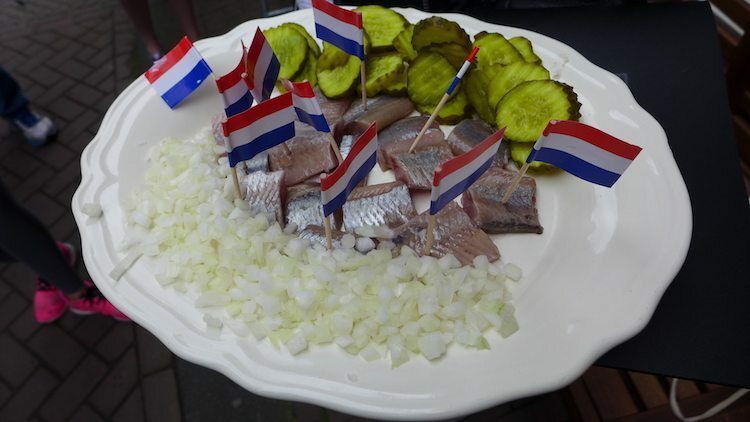 The Dutch love their herring and sell it from sidewalk stands the way New Yorkers sell dirty water hot dogs. 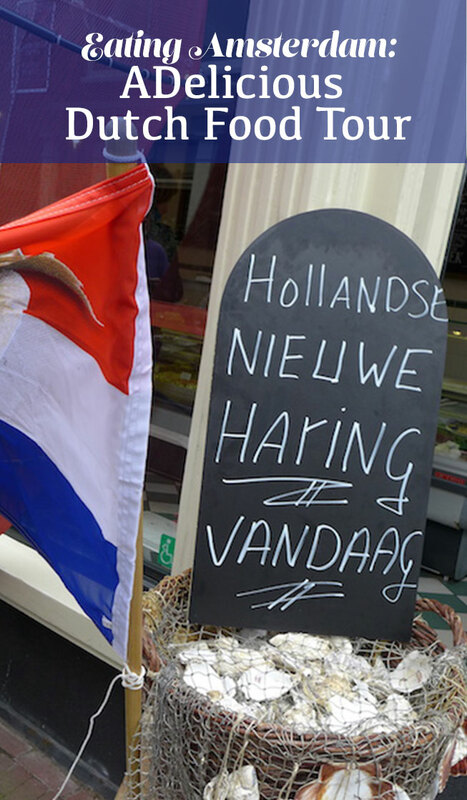 The first herring of the season are referred to as Hollandse Nieuwe and their arrival is the cause for celebration with banners and flags flying everywhere. And we’d stumbled upon the epicenter at Meer dan Vis. There are two ways of eating herring. Traditionally, only the rich could enjoy the whole fish, dropped down the gullet by the tail. We ate ours poor-style – served in bites for sharing, with chopped onion and pickles as accompaniments. The fish was bright, buttery and delicious. We were joined by a little guy who enthusiastically downed his herring. Um. Try getting your kindergartener to eat raw fish. 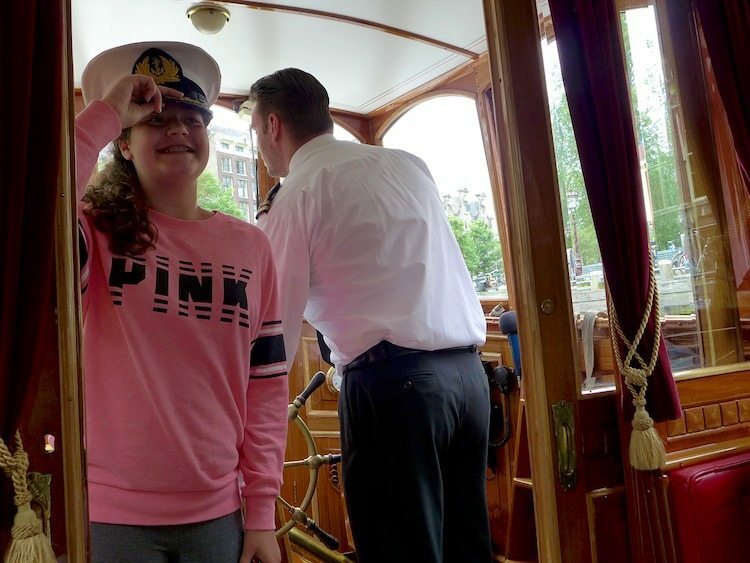 Eating Amsterdam offers several different tours and ours included a canal boat ride – a must-do when visiting the city. Captain Tony invited us aboard his lovely boat that once welcomed Winston Churchill as a guest. 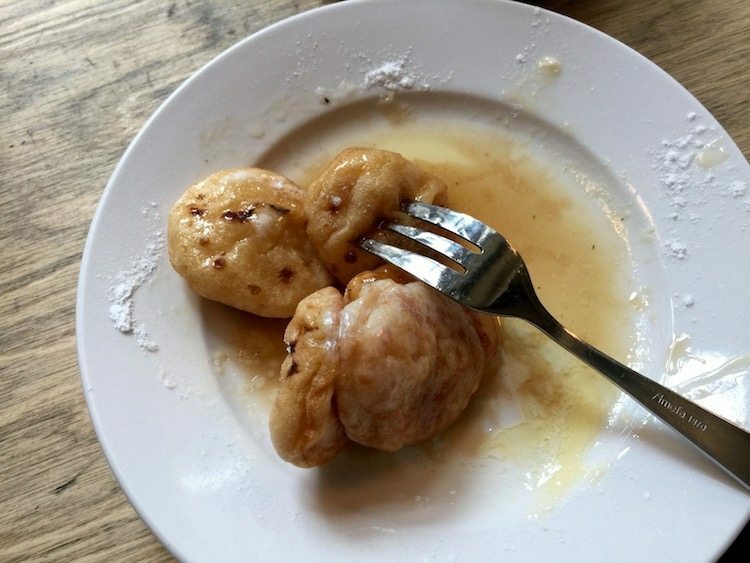 He pointed out the sights, including the Anne Frank House and Rembrandt’s burial site in the Westerkerk, and we sampled more traditional Dutch delights: young, old and older Dutch cheeses, bitterballen and meatballs. And, finally, a bit of liquid refreshment in the form of one of the few beers actually brewed in Amsterdam, Brouwerij ‘t IJ (Heineken and Amstel are not.). While motoring, we came upon a dredging operation. The canals are scooped each day to remove bicycles that have gone astray. It’s expected given the numbers; Amsterdam has 800,000 residents and 2 million bikes! We finished the day in Café de Prins. I always need some caffeine and a sweet treat in the afternoon to muscle through my vacations and, luckily, Annamaria and I were on the same page. The Dutch love pancakes. At breakfast, sweet or savory fillings are incorporated right into the batter and one fills the entire plate (think pancake pizza). Another variety is poffertjes, puffy, half dollar-sized ones made out of buckwheat flour and yeast. I convinced myself they were healthy as I dipped the powder sugar-coated nuggets into butter and syrup. We didn’t let the end of our tour stop us from eating our way through Amsterdam. We enjoyed a variety of different meals, including an elegant tapas-style tasting at Envy and a full-blown Indonesian rice table (rijsttafel) at Tempo Doeloe. We were well prepared to end each meal, thanks to the info we gathered during our Eating Amsterdam tour. To indicate the deliciousness of a morsel, the Dutch raise their hand near, but not touching, their cheek, wave it a couple of times and say, “Lekker. Lekker.” I lekker, lekkered so much I gained 8 pounds. This explains why the Dutch do all that cycling. Napoleon said “An army marches on its stomach.” Well, so do tourists. 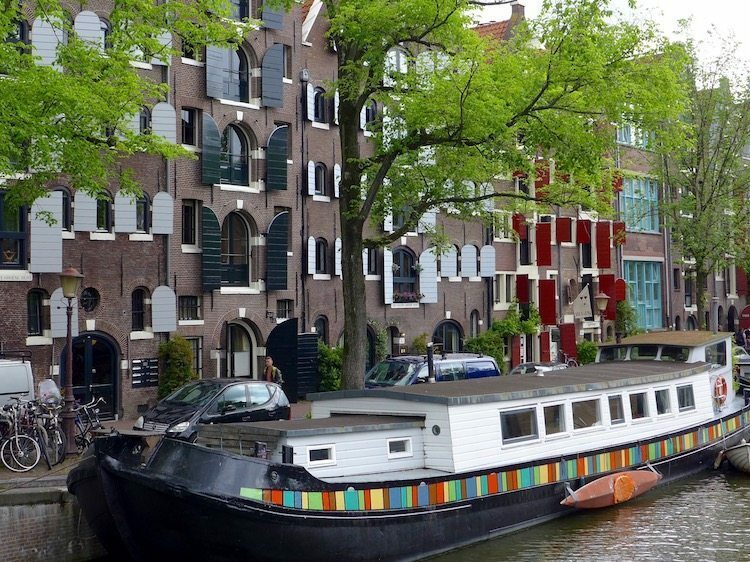 An excursion with Eating Amsterdam is a great way to shake hands with the city. Knowledgeable, friendly guides present interesting historical and cultural info while you sample the local cuisine. 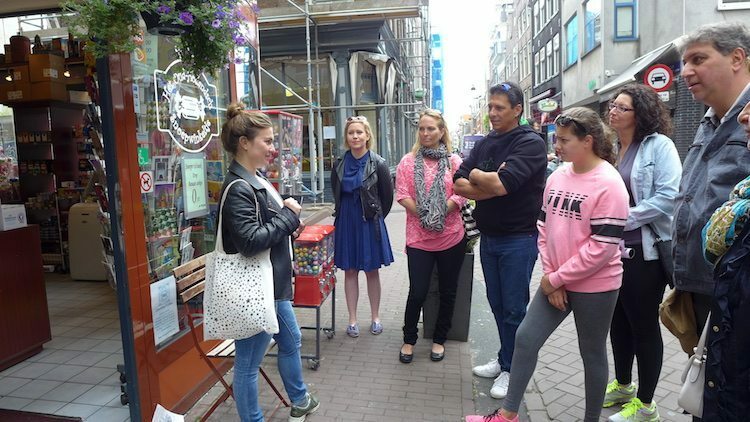 They offer 3 different tours: Jordaan Food, Jordaan Food and Canals and the Twilight De Pijp. Prices range from 70 – 90 euros per person. The tour group sizes are small, so advance reservations are highly recommended, especially during the busy summer months. 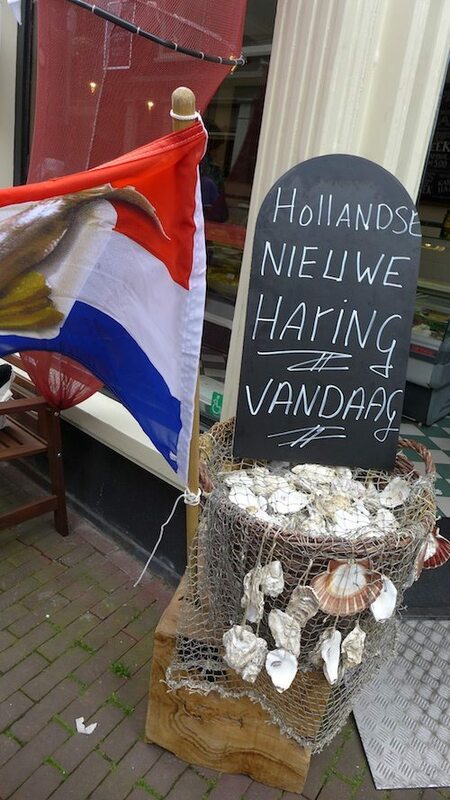 http://www.eatingamsterdamtours.com. Great pictures! And thanks for all those hotlinks — I am enjoying http://www.thedutchtable.com immensely!!! Eat it up and book a trip to Amsterdam immediately! Simply a terrific destination!